The beautiful Lake Shasta (or Shasta Lake) is California’s largest man-made reservoir and one of the largest lakes in western United States. 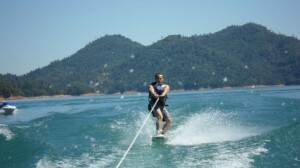 With 365 miles of shoreline at full capacity and a number of unique arms expanding from its center, Shasta Lake is the perfect destination for anyone’s recreation. Within the 365 mile shoreline is literally hundreds of coves and bays lined by rugged mountains and tall evergreen trees. Surrounding the lake is acres of wooded flats, rocky hillsides, waterfalls, secluded creeks and thousands of acres of mountainous country. Shasta Lake is perfect for a number of recreations, including fishing, boating, hiking, swimming, kayaking, and of course just the casual sun bathing. 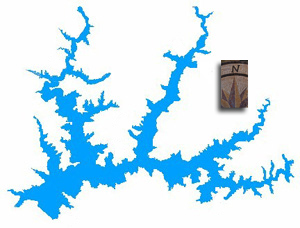 Shasta Lake is comprised of three major rivers (or arms) and a number of tributaries: Sacramento River, McCloud River, and Pit River. Between the sheer size of Shasta Lake and the variations between each arm, you may feel like you’re actually visiting multiple lakes. Each arm contains is own unique characteristics, environment and recreation. The construction of Shasta Dam impounded these rivers and created what is arguably our state’s most beautiful landlocked expanse of water.